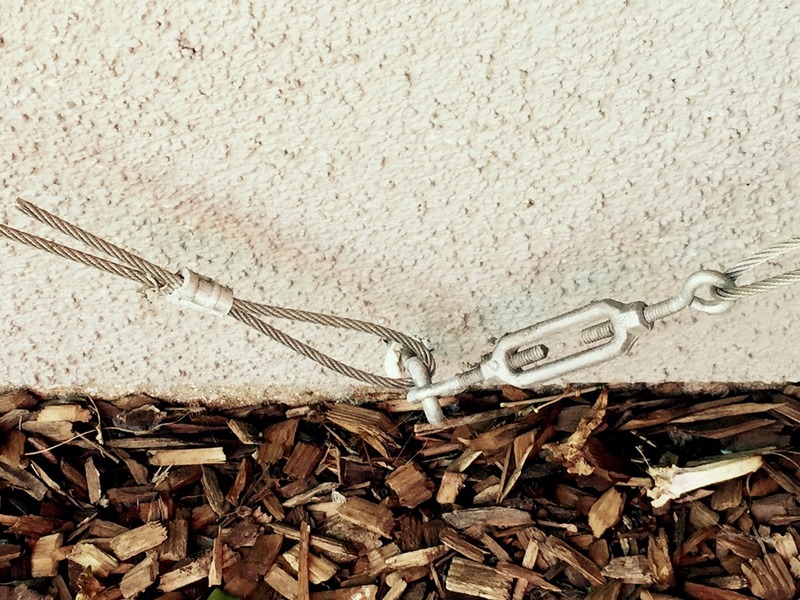 I was pruning some bushes over the weekend and reminded how years ago I greened up our plain retaining wall with an invisible wire trellis, I wrote about it in one of my early blog posts. I planted bower vine and allow it to grow random and wild, only trimming it or tying it to the trellis when necessary to control it. 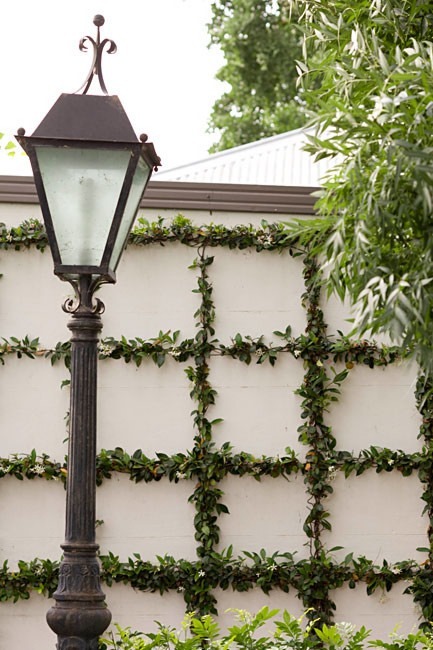 The trellis is constructed of wire and screw eyes and with the addition of bower vine has disguised the plainness of the wall, adding a welcome element of greenery. 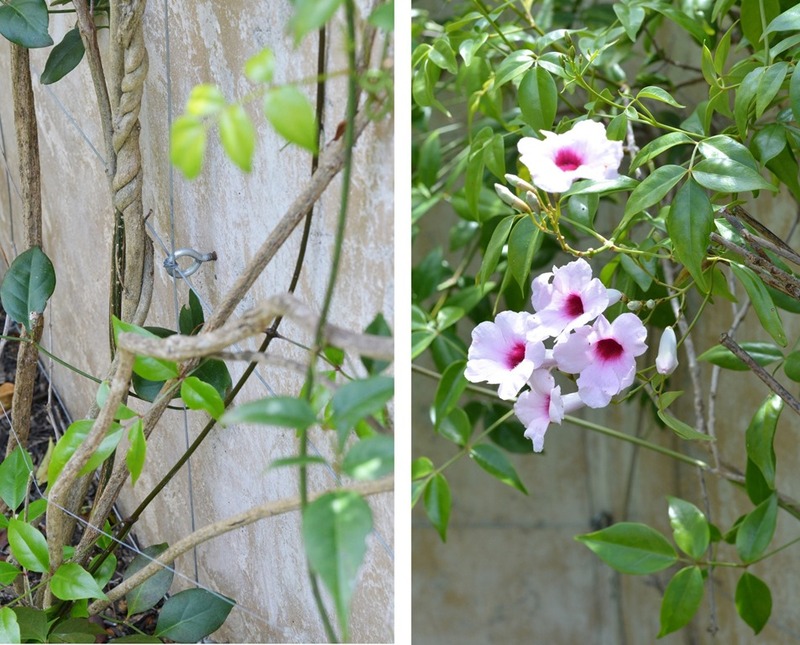 The leaves remain in winter and it blooms May through October with pink jasmine flowers. I spied a similar wire trellis at my local Whole Foods, the technique used to achieve the same effect, this one constructed with diagonal wires instead of in a grid like mine. It’s a simple construction, this one also used screw eyes secured to the wall and galvanized wire, and turnbuckles which allow you to tighten the screws and wires. The wire trellis is an alternative to a structure you can purchase online or in a garden store, those are limited in shape and size and more expensive. The wires can be used to support any meandering vine as seen above or more formally by clipping and training vines into geometric patterns. The art of espalier (pronounced es-pal-yay) is a favorite gardening technique for many people. It dates back many centuries, and was perfected by Europeans. Wineries and wine growers use a version of espalier to support grapevines, we also train our Pinot Noir vines each year, although less formally. Whenever I see it in its most formal application I admire it very much because it takes patience and control, but the result is worth the wait, just like this tree I spied on a walk through Pacific Heights in San Francisco last year. 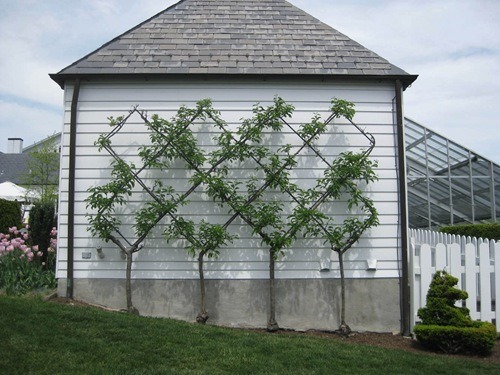 Espalier is the process of manipulating tree branches by forcing two dimensional growth along a constructed trellis on a single plane instead of allowing the branches to bloom outward in all directions. 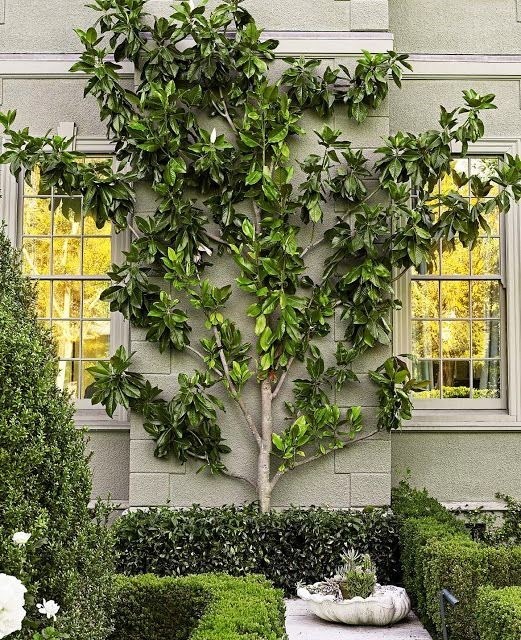 There is a beauty to espalier but also a practicality, it is a clever way to add botanicals to tall walls or narrow outdoor spaces. The technique can also be used to create living fences or arbors as well. 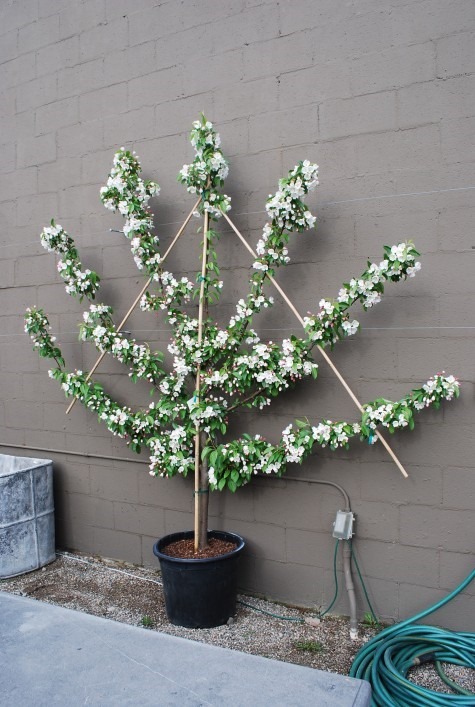 Fully trained, espalier trees are a focal point and work of art whether they’re ornamental or fruit bearing. 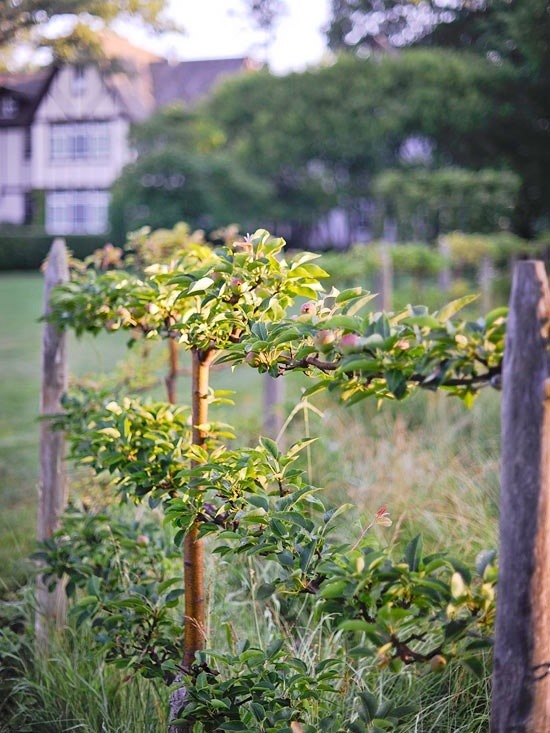 It takes many years to train a tree and you can do it yourself with research, patience, and careful pruning or you can purchase an established espalier tree at a local nursery from specialist. 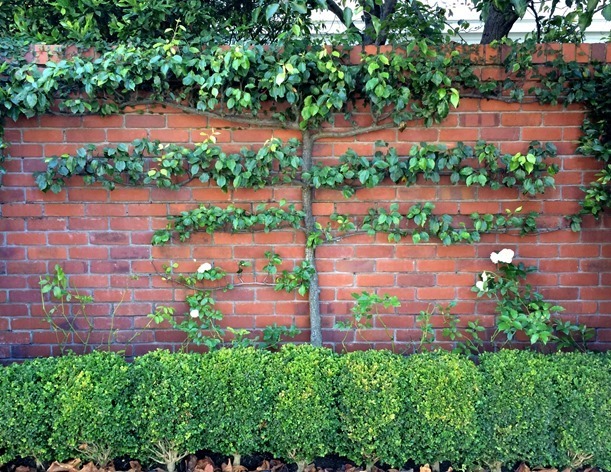 There are several defined types of espalier, the most recognizable is traditional horizontal Cordon. The Palmette Verier allows for a middle branch then the offshoot branches are trained to grow horizontal then vertical in a fork shape. A criss cross design is referred to as Belgian Fence and also takes careful training. The informal style is just as beautiful, trained only to grow flat against the wall and nothing more. 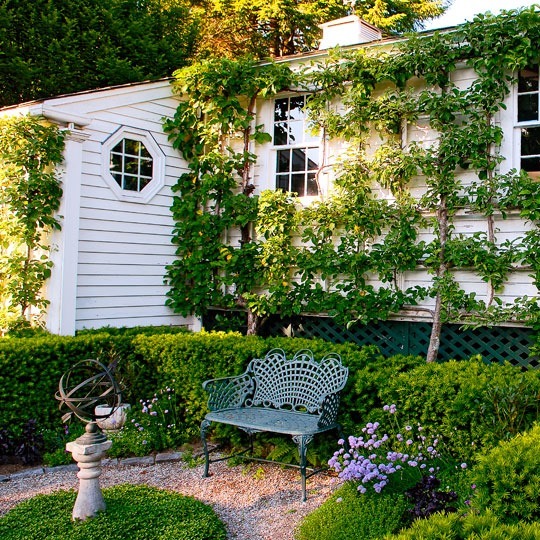 How have you trellised your vines in your yard, formally or informally? 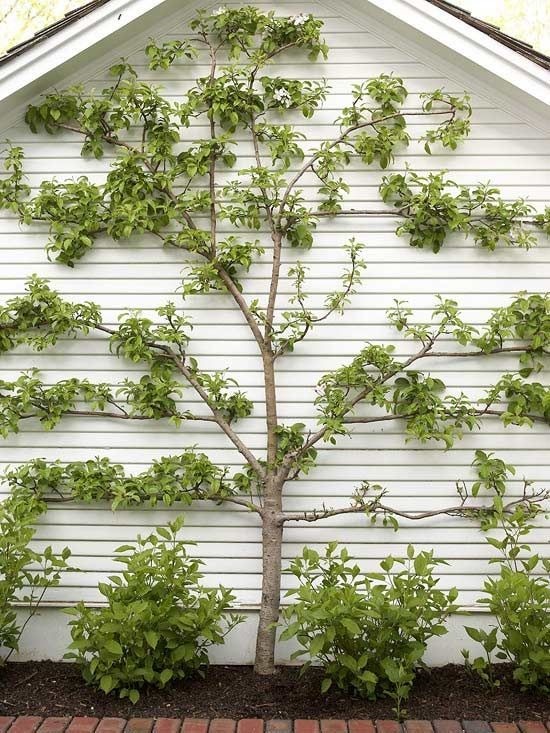 Have you ever tried espalier with success? Espalier dwarf apple trees are in the grand plan for our vegetable garden( potager) as a living fence. I am French and grew up admiring this type of planting, in particular in some of my parents’ friends’ gardens. When I laid out our garden plans my husband said ‘ espa- what ? !’ He thinks I am half crazy but goes along with it, the trellises are going up this year for the rose vines. Apple trees may be next year! It is taking forever to bring the vision to life, slowly but surely we’re getting there. 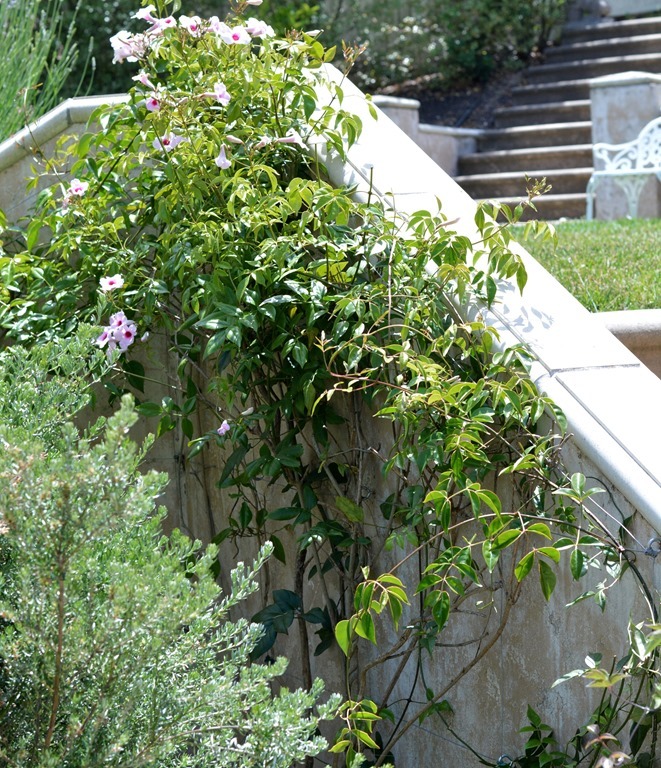 What a great post of trellis vine options! I have a Virginia Wall Creeper that I purchased at the Asheville Farmers Market last fall. The purchase was in honor of riding the Virginia Creeper Trail with my 2 sisters in October. 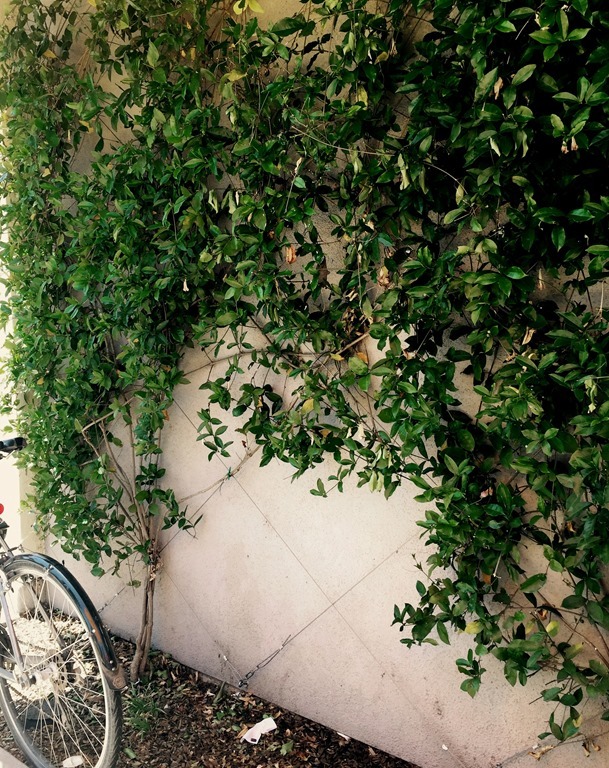 What a great trip it was… your post gives many ideas and thankfully I have a wall on my house for the vine !! Love your blog and the variety of your posts ! We just renovated our yard (we’re in Petaluma too) and put in espaliered apple, pear, lemon and thornless blackberry along the fence line. It looks amazing and we’re getting our first apples this year on the tree! We purchased pre-espaliered trees to make it a little easier but it will still take years before they fully fill out on the wires. The blackberry or any vine berry is a great plant to espalier too, it fills out quickly! I love greenery and plants inside and outside the home. I wish I could trellis vines in my house. I love the idea of training vines in geometric patterns. Too gorgeous! Lovely! Great visuals. I’ve always wondered… what happens when you need to paint your house? ah-ha! finally explained, and so well. the ‘invisible’ part is an art. my climbing roses could use this kind of help. thanks for sharing! We had an espalier apple tree in our front yard that had gotten out of control. I can’t tell you how many landscape people we had out for help and they all looked at me like I was crazy. Why would I have a tree grow up against the house like that? Why did the tree look like that? They had never heard of an espalier tree! How can you be in the business and not know about these? 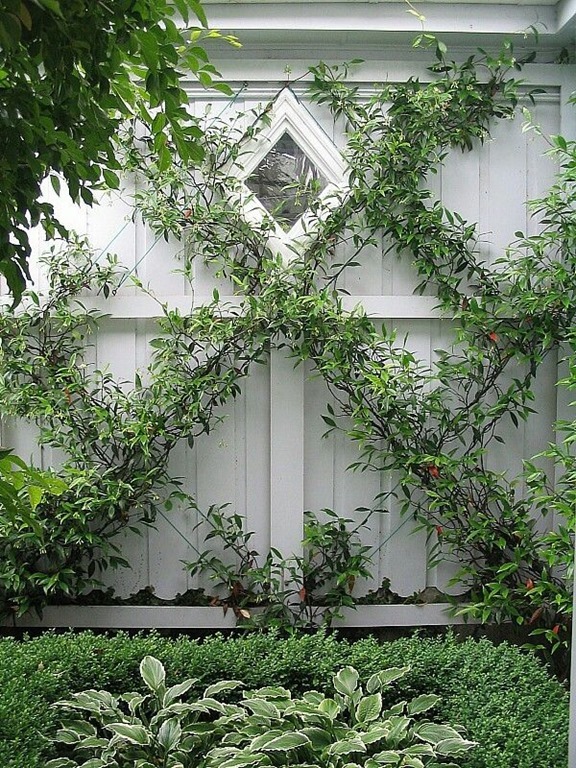 lol Love the idea of the invisible trellis…..
Love this idea! It brings a sense of freshness into the space. I love the look of the geometric designs. Oh my word…these are all GORGEOUS! Wish I was a west coast girl so I could grow these easier!! I’ve always loved this technique. 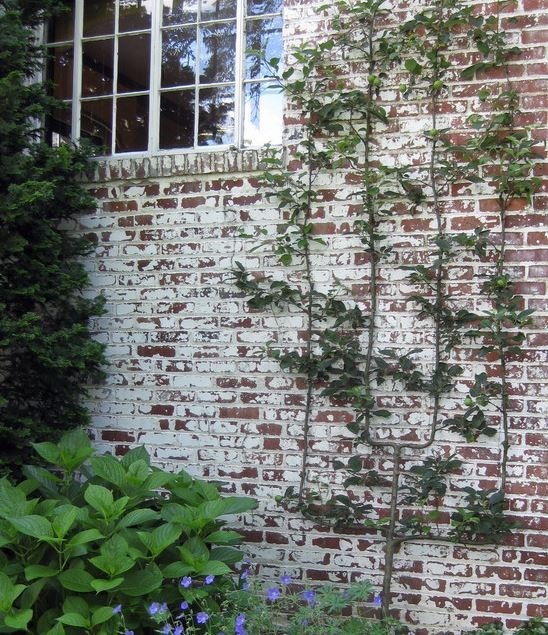 Once lived in a house with susanqua espaliered along a brick garage wall. It was beautiful – and the previous owners did it. But what do you do when a wall or fence needs painting? I had an espalier pyracantha growing against my house in south Alabama. It was beautiful but not much fun keeping it trimmed…the thorns on pyracantha are very large and hurtful if you get stuck! Talk about timing!!! This was just recently added to my to-do list and I cannot wait to install my diagonal wire. It’s going up on my fireplace. The fireplace wall is vast and, frankly, an eyesore (I hate stucco). I live in Orange County, CA so I’m hopeful that the vine will grow quickly. Thanks for the post!! Hi I’d love to see you do an update to this postbox so many of us are doing this, but you know, YOU ARE OUR LEADER!!! Thanks so much for continuing to blog, while so many people have finished their homes and stopped. You’ve always been the star, the leader the queen and the king. Great post! I’m in the midst of creating an espalier out of a pretty vine I found at our local botanical garden center. I’ve picked a wall, chose a pattern, purchased a gorgeous large Terra cotta trough, filled it with Chinese hat vine.. now we have to do the hard work, create the Belgian fence pattern on the wall. I’m so excited! !